Modelled on the legendary Moroccan Marathon Des Sables, the Kalahari Augrabies Extreme Marathon is not for the faint hearted. The race takes place annually in the ruggedly contrasting landscape of the Northern Cape’s “Green Kalahari” and is a self-sufficiency run held over six legs (one day/night) in seven days. Distances are set for each day, ranging (in 2009) from 25km to 82km. Athletes are obliged to carry on their backs everything they plan to use or consume for the duration of the event: food, sleeping bag and mat, cooking pots, toiletries, clothes and compulsory safety/survival equipment for the duration of the event. Most participants carry 30 liter backpacks with starting weights ranging from 12-15kg. Overnight shelter in rudimentary camps and water (which is very strictly controlled and distributed during the race) is supplied. 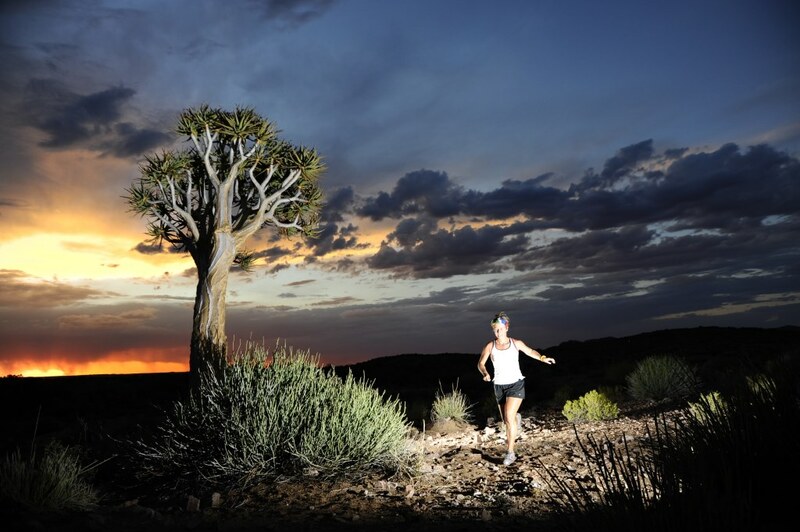 The route is marked throughout the course, and offers incredible contrasts with landscapes ranging from fertile vineyards along the Orange River to steep rocky outcrops, sweltering sandy gorges and the vast stretches of nothing which are characteristic of the Kalahari Desert. Temperatures vary from mid to high 40’s (degrees Celsius) during the day to single figures in the evenings. After a week end of unheard-of rain, the 10th KAEM kicked off on 4 October with a record field of 73 entrants from all over the world. Within minutes the runners were covered in swarms of fierce “miggies” (midges) intent on diving into our ears/nose/throat/eyes and biting whatever exposed flesh they could find. Those of us who had come to the start armed with nets to wear over our faces patted ourselves on the back. It was with great relief that we made it to the end of day one with only one casualty. The runners were “housed” in 4 tents, the occupants of which quickly became “family” despite their sweatiness, incessant snoring and uncomfortably close proximity. The camaraderie and humour on a race like the KAEM is remarkable and lifelong friendships are often forged in 7 days. By day 4 I had the extremely good fortune of teaming up with Louise Clamp and Daksha Hargovan, (both legendary athletes and women of extreme substance and humour, incidently both wearing NB RX 1441 AT’s and both blister free) and to my enormous surprise I discovered half way through the dauntingly long day/night stage that I was in fact having fun! We discovered that our energy levels and speed were directly proportionate to the amount of conversation (dazzlingly witty and intelligent but tending to focus rather obsessively on food fantasies after days of freeze dried and smash!) we generated and the checkpoints literally whizzed by. By stage 5 I was feeling so good (completely injury and blister free, thanks to a lot of prayer, good foot care and a brilliant pair of NB’s!) that I felt obliged to fake the odd limp in front of the many walking wounded. By that stage many feet were beginning to fall apart and their owners were literally hanging on by the skin of their teeth. Despite the anticipation of a Karoo Lamb braai, a shower and a soft bed I was genuinely sad that it was all coming to an end on the 7th day and the trot to the finish line seemed to be over in no time despite the extremely taxing gorges, rocks and river bed. Congratulations to the winners and thanks again to Estienne and Nadia Arndt and all the brilliant crew and medics for another superbly organised event.